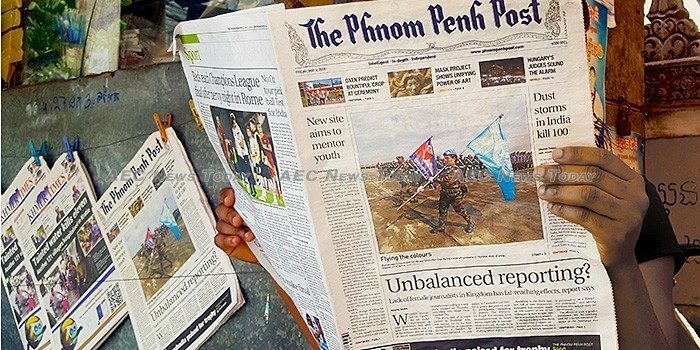 Editor-in-chief, Kay Kimsong, business editor Brendan O’Byrne, and sub-editor Ananth Baliga are the first casualties at The Phnom Penh Post following its sale to Malaysian businessman Sivakumar S Ganapathy last week and announced over the weekend. In a blistering memo reportedly sent this morning to The Phnom Penh Post office obtained by AEC News Today titled ‘Statement by Sivakumar S Ganapathy, owner of Phnom Penh Post (sic)’, Mr Ganapathy ordered the three be ‘terminated with immediate effect’. Describing yesterday’s story on the sale of The Phnom Penh Post as bordering ‘on internal sabotage’, an obviously furious Mr Ganapathy said he considered the story ‘extremely damaging to the guiding principle of the purchase and takeover of the (sic) Phnom Penh Post’. The memo then lists seven specific items that particularly rankled him, starting with the incorrect spelling and presentation of his name, the new ownership structure, his position at Asia PR, as well as claims relating to the firms past work and clients. The memo makes no mention of the original Post Media media announcement by former chairman Bill Clough that said the publication had been sold to ‘Sivakuma G (Siva)’. 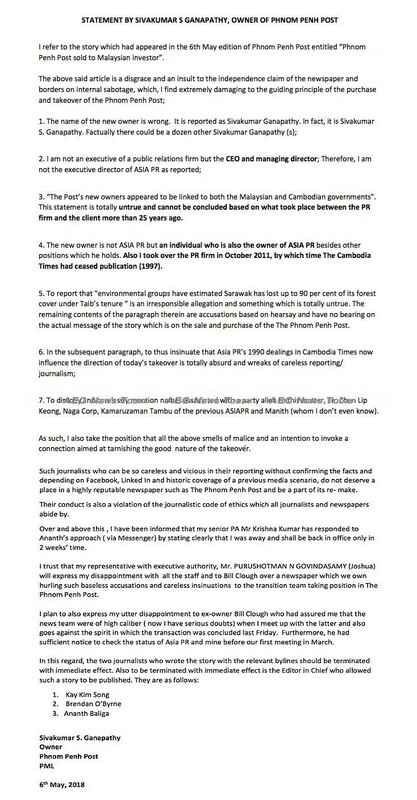 In the memo Mr Ganapathy also refutes any relationship with Brigadier General Hun Manith, fourth child of Cambodia Prime Minister Hun Sen, and points out that he took over Asia PR in 2011, well after the Cambodia Times had closed. Concluding the stinging critique, Mr Ganapathy said that combined “all of the above smells of malice… aimed at tarnishing the good nature of the takeover’. Describing the conduct of the authors of the story Phnom Penh Post sold to Malaysia investor as in ‘violation of the journalist code of ethics which all journalists and newspapers abide by’, without stating which particular codes he is referring to, Mr Ganapathy’s memo orders that ‘the two journalists who wrote the story with the relevant bylines should be terminated with immediate effect. Also to be terminated with immediate effect is the Editor in Chief (sic) who allowed such a story to be published’. The memo then goes on to name the three individuals. Mr Ganapathy’s memo says he intends to “express my utter disappointment to ex-owner Bill Clough who had assured me that the news team were of high calibre (now I have serious doubts) when I meet up with the latter and also goes against the spirit in which the transaction was concluded last Friday. Appointing Purushotman N Govindasamy (Joshua) as “my representative with executive authority”, who AEC News Today understands will also assume the position of editor-in-chief, Mr Ganapathy said that he hopes his disappointment will be expressed to all staff and Mr Clough. A few minutes later Mr Baliga tweeted: ‘A representative for the new owner has just fired @phnompenhpost editor in chief Kay Kimsong’. According to the above memo Mr Ganapathy is travelling in Malaysia for the next two weeks. Emails sent by AEC News Today to Asia PR’s Kuala Lumpur head office were not responded to prior to publication. As this article was being prepared for publication AEC News Today was told that additional resignations were expected and that some form of ‘crisis meeting’ was taking place between the new management, their lawyers, and Post Media staff demanding to know why Mr Kay had been terminated. This story will be updated as additional information become available. What Irked Sivakumar S Ganapathy so Much? 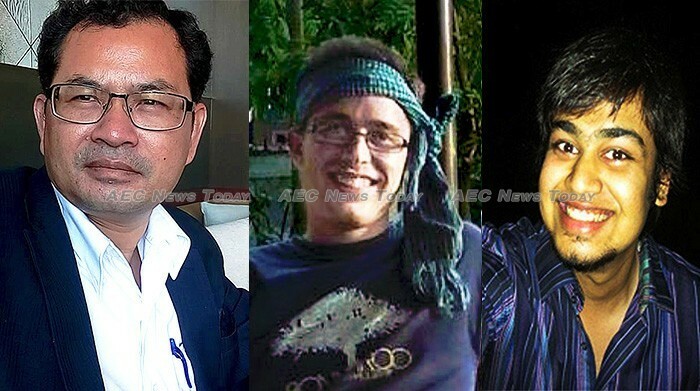 The Post’s new owners appeared to be linked to both the Malaysian and Cambodian government. This statement is totally untrue and cannot be concluded based on what took place between the PR firm and the client more than 25 years ago. The new owner is not ASIA PR but an individual who is also the owner of ASIA PR besides other positions which he holds. Also I took over the PR firm in October 2011, by which time The Cambodia Times had ceased publication (1997). To report that “environmental groups have estimated Sarawak has lost up to 90 per cent of its forest cover under Taib’s tenure” is an irresponsible allegation and something which is totally untrue. The remaining contents of the paragraph therein are accusations based on hearsay and have no bearing on the actual message of the story which is on the sale and purchased of the Phnom Penh Post. To directly and carelessly mention names associated with a party alien to this matter, i.e Chen Lip Keong, Naga Corp, Kamaruzaman Tambu of the previous ASIAPR and Mantith (whom I don’t even know). The link to The Phnom Penh Post story Phnom Penh Post sold to Malaysia investor was removed due to the original story having been replaced. An earlier update replaced an incorrect author’s byline.